Gladys Bee Munselle was born Oct. 21.1922 in Menard, Texas to Heba Hortense Ransom Munselle and Joshua Walter Munselle. She was the eighth child of nine, and at 96 years old, was the last of her family to leave this Earth. She is survived by her two children, Mary Lanette Causey and Charles Scott Causey, and one foster daughter Patricia Rippeteau Carter. She has 13 Texas grandchildren. She married Seth Thomas Causey and they were sealed in the Mesa Az temple. Seth (Curly) passed away suddenly in 1963. 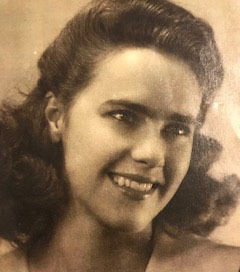 Gladys worked hard as a hair stylist and then a computer programmer for the State of Texas, in Austin Texas. She served a full time mission to Georgia. After her mission, she went to Provo,Ut. as a Dorm Mother. A friend she had known from Austin, Carolyn Powell Thompson, urged her to meet her father recuperating from knee replacement in Provo. Ut. Gladys went to introduce herself to Edward Bleak Powell and not long after ( Sept.1973) they were wed and the rest is history! She moved with Bleak to Susanville, California where he had raised his family with his wife Evelyn, who had passed away early in 1972. She gained another group of children and grandchildren (last count 97 grandchildren and great grandchildren with the combined families). Bleak’s children, Roger (Virginia), Caroly (Roger Thompson). Dondavid (ReNee) Diana (Merlin Hill) Larry (Rose) and Kathy Powell( now married to Reed Nelson) welcomed her and embraced her fine homemaking skills and excellent cooking talents. Bleak and Gladys were married 20 years, serving three Spanish speaking missions (Guatemala City, Guatemala; Asuncion Paraguay; and Lima Peru). Bleak passed away in 1994 and Gladys returned to her beloved Texas. Gladys was an excellent seamstress and her Southern Cooking recipes are still treasured in many a recipe book (although no one has been able to replicate her fudge). She learned to oil paint in her mature years and showed natural talent with her paintings. She enjoyed crossword puzzles, scrabble, skipbo and bunko. She was a gifted singer and loved to sing all her life, especially the Baptist hymns she learned as a child. She was a student of the scriptures and loved to discuss and study gospel topics. 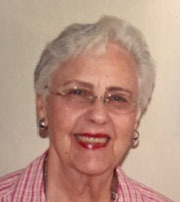 In Sept. 2014 she moved to the home of Reed, Kathy and Lexie Nelson where she enjoyed many hours of gospel study, home evenings and scriptures. She loved having Reed or Lexie read to her. She keep her mind sharp by memorizing scriptures and songs. She enjoyed the visits of her Powell children and grandchildren and looked forward to visits from Lanette, Ian and Dennis from Texas for her birthdays. She loved the phone calls and notes from beloved friends and family in Texas. Her last four years were spent in the Franklin County Transitional Care Center where she loved church, games and visits. Special visitors, LaVon, Sheila and Patti brought her such joy. Terry and Gina adopted her and visited her faithfully. The administration and staff gave her tender care and are very much appreciated. Gladys gently passed away January 19,2019 and joyfully rejoined her loved ones on the other side. She loved the Savior Jesus Christ and bore testimony of him every chance she had. Gladys was intelligent, grateful, outspoken…a force of nature. She was greatly loved and will be greatly missed.